The Blackstar HT Stage 60 112 MK II Guitar Amplifier Combo is the perfect amp for hitting the stage with night after night on tour. The all-valve power is delivered through a pair of high quality Celestion speakers, guaranteeing immaculate tones that are perfect for any musical genre. If it's boutique-style quality at an affordable price, it doesn't get much better than this. The Blackstar HT Stage 60 112 MK II boasts a pair of ECC83s and a pair of EL34s, a high-powered partnership that creates a heady combination of crunch and warmth. There are three footswitchable channels to choose from, with each channel boasting two voice options to give you an impressive six footswitchable voices. The boutique-style clean channel offers two modes - 'British Class-A' and 'dynamic US', with expanded tone controls for you to pull whatever kind of tone you can imagine from this beauty. 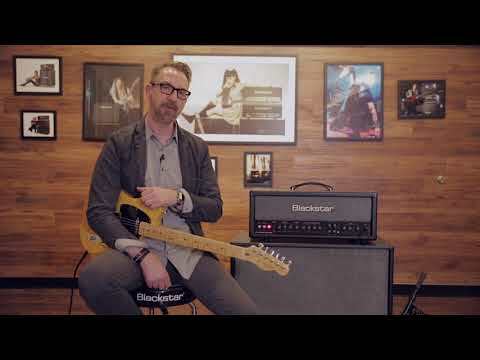 The two high-gain overdrive channels both Blackstar's patented Infinite Shape Feature (ISF) tone-shaping controls, giving you limitless potential with regard to sculpting your dream tone. The Overdrive channel offers a three-band EQ to dial in settings that are just so, whilst the ISF pot lets you sweep from a US-style amp output to a British-style amp output - and everywhere in between. The HT Stage 60 112 MK II has a redesigned digital reverb circuit, which features switchable Dark/Light settings. The Dark setting is based on a room reverb, whilst the Light setting is based on a plate reverb. Whether you're playing in a small venue and want to create a larger impression, or want to dial it back and keep your tone tight, the reverb effect gives you the ability to inject depth into your tone. As well as the Reverb dial, you'll find Resonance and Presence dials in the Master section. Here you can tweak the overall tone of the amp output, to perfectly your tone to the room you're performing in. When you're cranking it out at high volume levels, you can rest assured that you'll find that sweet spot with ease. The addition of an Effects Loop means that you can input outboard effects via send and return connections to expand your tone shaping options. The Blackstar HT-Stage 60 112 MK II is equipped with a range of connectivity options to meet your demands. When laying down tracks in the studio or on the fly, the professional USB audio connection allows you to output up to four channels of the guitar signal, dry, preamp out, and stereo emulated out into your DAW of choice. There are additional outputs that includes a pair of speaker emulated outputs (XLR and stereo jack) with 1x12 and 4x12 options. When performing live, the Blackstar HT Stage 60 112 MK II boasts a cool Celestion speaker that translates the sweetness of your tone transparently. However, you also have 1x16/1x8 or 2x16 Ohm options for connecting to external speaker cabs if you fancy a bit more juice. At the other end of the spectrum, you can reduce the power output to 10% of the total output to gain full wattage power and tones at a significantly lower volume output - perfect for laying down chops in the studio or practising at home. If you fancy going one step further when practising, you can output to a pair of headphones.